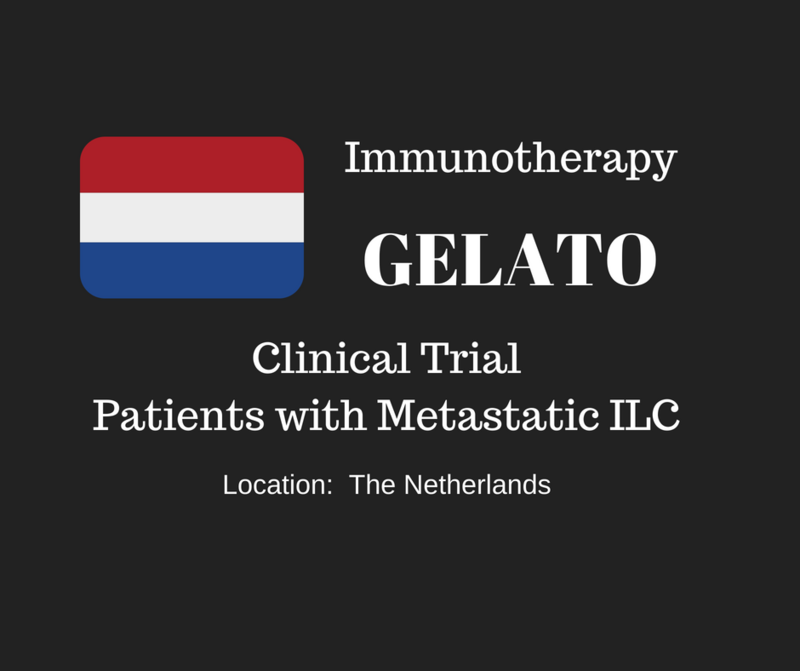 The GELATO clinical trial is a lobular breast-cancer specific immunotherapy trial investigating the response to an immunotherapy + chemotherapy medication combination. This phase 2 trial is open to metastatic lobular breast cancer patients and is being conducted in the Netherlands. Goal of this Trial: This clinical trial (recruiting patients as of August 2018) aims to discover if a combination of chemotherapy and an immunotherapy medication is effective in lobular breast cancer patients. Additionally, this trial hopes to discover if there are any markers that correlate with response to this combination of medications. Background: There are recent studies indicating that tumors in a subset of patients with lobular breast cancer express many immune cell markers, and/or are infiltrated by immune cells, and thus might be responsive to therapies targeting the immune system (Ciriello et al, PMID:26451490; Michaut et al, PMID:26729235; Desmedt et. al, PMID:29471435; Du, et. al, PMID: 29739984). Eligible patients: Patients with metastatic lobular breast cancer who are residents of the Netherlands. The trial coordinator may consider others who can speak Dutch and have a place to stay during the early part of the trial. For more information regarding the clinical trial, please contact the Principal Investigator Marleen Kok, MD at +3120512 ext 9111 or m.kok@nki.nl and review the trial listing on the ClinicalTrials.gov website. The Lobular Breast Cancer Alliance shares information about ongoing clinical for lobular breast cancer. LBCA does not sponsor or run the clinical trials, and the scientific validity and safety of the trials is the responsibility of the trial investigators. Learn more by contacting the clinical trial coordinators listed above directly. Patients should always discuss their participation in any clinical trial directly with their doctor – these Questions to Ask your Doctor may help. Learn more about participating in clinical trials. Learn about other lobular breast cancer clinical trials and studies.